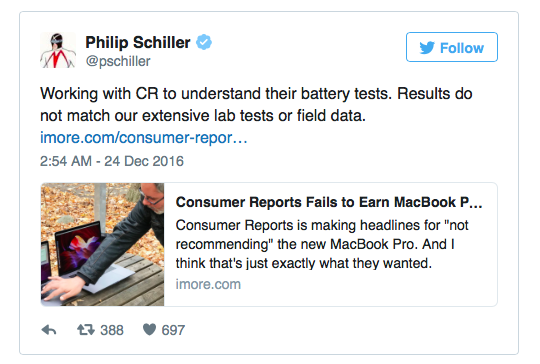 Schiller tweeted that both companies have started to work together to find out why the new MacBook Pro performed so differently in a row of same tests. Hopefully, soon we’ll see the results of this cooperation. The results of the tests conducted by Consumer Reports have met mixed reviews due to the obscure procedure of testing that involved loading of specific pages located on their own servers. Instead of changing the testing method or using other machines, the researchers posted their figures on the Internet straight away. These figures could affect Apple’s reputation, so the company has decided to figure the things out.